Water, tomato paste, worcestershire sauce (distilled vinegar, molasses, corn syrup, water, salt, caramel color, garlic powder, sugar, spices, tamarind, natural flavor), sugar, canola oil, red wine vinegar, BBQ spice blend (salt, onion powder, granulated onion, spices, garlic powder, granulated garlic, ground celery), molasses, salt, mesquite smoke, onions, bell pepeprs, dehydrated onions, caramel color, Texas champagne pepper sauce (peppers, vinegar, salt), spices, garlic powder, xanthan gum, and onion powder. *Contains Milk and Soy ingredients. 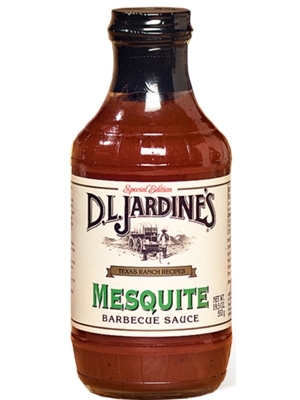 I have tried all kinds of different mesquite sauces but when a friend asked me to try your sauce - well lets just say that I don't have to look around any more. It's everything that you would want or expect. Whenever I enjoy my mesquite if I close my eyes it is as if I'm out on the trail and eating around the campfire. Its great. Thank you for making such a great AMERICAN MADE sauce!!!!!!!! Vince Nance. N. Myrtle Beach, SC.